This makes me want to start playing the Pokemon Collectible Card Game again (it's been about 10 years since I've played). Super Dungeon Explore - Hottest new miniature/board game on the market? 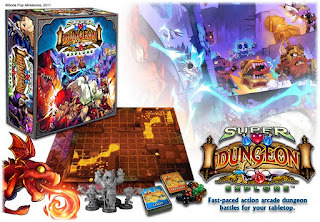 Super Dungeon Explore (SDE) is a dungeon crawler, inspired by old japanese console-RPG's. The miniatures are done in a cute / chibi / super-deformed style, that means the head is roughly the same size as the rest of the body. One to five players take the role of classic fantasy heroes like the human paladin, a dwarf fighter or an elf ranger. One player is the "Dark Consul" who controls the monsters of the dungeon. The game is played on modular dungeon boards. In a round of play the game passes back and forth between single heroes and the monsters, but the exact order may change from round to round. The characters use the stats from their character card, special dice (with hearts, potions and stars) are only used for combat and checks. If the heroes wound the opponent they may draw loot cards to improve their stats. There is also the possibility to open treasure chests to find even more powerful things. The monsters have no possibility to "level up" but the Dark Consul has an unlimited number of them. 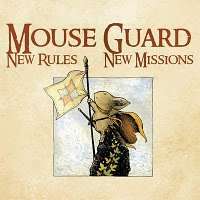 A new Mouse Guard supplement is available in PDF format. This supplement was originally available only in the Mouse Guard Boxed Set. The supplement contains new rules for using mounts, weapons for conflicts and three new locations for adventuring. It's been almost a year since I broke the news about Lord of the Rings miniatures coming to HeroClix. Well the wait is finally over. The LOTR starter set and single booster packs release this week. These are fully compatible with the HeroClix Gaming Engine. These are also going to be perfect when we play The One RPG game (Adventures in MiddleEarth). Mysterious projects, villainous experiments, and superpowered opponents constantly challenge Clark and his companions. Rising above them all is the Watchtower, always ready to provide support, guidance, and direction for these heroes. 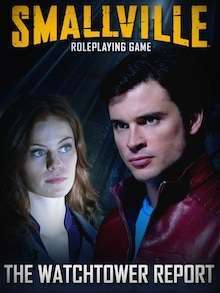 This sourcebook expands and builds upon the rules found in the Smallville Roleplaying Game with a special focus on antagonists and opposition. The Watchtower Report also features a Season Ten update to the Smallville RPG, spotlighting new allies such as Booster Gold and Blue Beetle in addition to new threats like Granny Goodness and General Slade Wilson. As many of our viewers know the KGS Post Apocalyptic RPG Games. Atomic Highway is one of our favorite games we have played. We at the KGS are very interested in game companies that support their games, whether it be online support or just timely expansions. Well the following game caught my eye and looks to be a game we would all enjoy - Mutant Epoch. Not only Core Rules, and One Expansion so far but a MONTHLY magazine just for the game. Also for anyone purchasing the book you get a free life time membership to the SOE Online Club which offers exclusive online support for the game. I will be checking with my FLGS for availability of this game and hopefully will have it in hand soon for a full review. Happy Thanksgiving from the KGS Family !! Sorry for my long delay in putting up another review. Nevertheless, I'm back with another online game you can play for free online. Now it shouldn't be a secret that I favor strategy games over any other genre. So today its time to delve into the realm of Action games. And while I like this game, I'm not quite sure how Fishy counts as an action game. But thats beside the point, lets get it on! In fishy, you start off as a small fish. But you have big dreams, for yourself anyway. The objective is also simple; all you do is eat fish that are smaller than you. You also have to avoid being eaten by bigger fish, something which I will get to later. Also, there is NO saving; you either get so large that you take up the entire screen, or you die. You use the directional buttons for moving around the screen. For those out there that prefer AWSD, I tired it and it will not accept them. Now as I mentioned you die by being "eaten" by any fish that is larger than you. However the game seems to have a different deffinition of "eaten" than I do. If you die by being eaten, to me that means avoid the mouth. But not in this game. If you so much as come in contact with a bigger fish, even its tail; you die. Just thought that was some helpful advice. All in all I do enjoy this game. But it certainly doesn't make my top 5. Its very simple but suprisingly hard to complete. You could put 15 minutes into this game and then die, forcing you to restart. Some people would not be discouraged and keep on going, and to an extent neither am I. But there comes a point where one finally says "ok, I've had enough" and finds something else to do; and there isn't a good chance they'll be coming back. Leave a comment or send me a message on Facebook for any online game you would like me to review. Take your Savage Worlds games to new depths of darkness with the Horror Companion. Inside are new rules for playing monsters, signs and portents, buckets o' blood, ritual casting, new spells, sanity, gear, new Edges & Hindrances, Setting Rules, over 100 new monsters, advice on creating and maintaining atmosphere, and MORE! This tome of terror is essential for anyone running a dark or horrific setting. WizKids has finally made the Star Trek announcement I have been waiting for. Star Trek Tactics is the Star Trek ship miniature combat game that I thought Star Trek Fleet Captains was supposed to be. Star Trek Tactics Series 1 will feature 20 pre-painted Federation and Klingon vessels. Using the HeroClix Game Engine for ship abilities and combat to take place on a 2x2 or 3x3 map. Looks to be a very low price point too, the starter set is going to go for about $20 which covers 4 ships, rules, maps, and tokens while single ship boosters will be available (yes it's collectible) for about $3.99. WizKids has already announced Organized Play featuring EXCLSUIVE ships and maps available only in official tournaments. This Series 1 set releases in February. Look for tournaments hosted by KGS beginning in February. Wings of War with 11 people! Wings of war is a World War One air plane combat game where you use little planes and a deck of maneuver cards for that plane to move your plane around the table and imitate the actions of a WW1 dogfight. Of all the games I know I think Wings of War is more scalable than any other game. What I mean by that is that it plays as well with 2 players as it does 12 players. This last Saturday, Nov. 4th was our 3rd Dude Night at Kevin’s home. If you’ve read Scott or my write ups about the other 2 times you know all about his ping pong, air hockey and pool table. You also know that the last two times we played Fantasy Flight’s game Moto Grand Prix. The Dude Night before this one was a little less attended then the first one so this time I brought a wider range of games to play. Only 3 of the 7 made it into the house but that was plenty. By the time we we’re ready to play we had 9 people. That would have worked just fine for another night of Moto Grand Prix but since we’ve played that twice I thought it was time to put some variety into Dude Night. I explained to everyone that we we’re going to play Wings of War, a WW1 dog-fighting game. Once we got sides picked I passed out the player ‘dashboards’ and planes. Most people haven’t played table top miniature games like this before so it’s always good to explain to them that where the plane/figure is is important. In most games like this you measure from a fixed point on one plane/miniature to a fixed point on another, moving a plane/miniature will change the distance that you’re measuring to and change a miss into a hit at a tense moment of the game. So bumping or moving your plane more or less than what’s called for is cheating and will throw off the game. So five minutes of explanation and everyone was ready to play. As the game started Scott and I took over the role of mediator’s, necessary people to have for any large game. We played till one side had 4 kills. After a turn or two we added 2 more people to the game, late arrivers, to give us 11 people playing at once. This was great fun and everyone got the hang of selecting their movement and moving their planes. Nobody ever really got the hang of working as groups to gang up on the enemy but then caught on enough to make it that I was the first person shot down! We played that if you we’re shot down you came back on with the next set of cards which kept everyone in the game till the end. A good time was had by all of us. Afterwards I got comments from most everyone that they had never played a game like that before and that they couldn’t believe how much fun they had. Two or three went so far as to tell me that they we’re going to buy it for their family to play at Thanksgiving and Christmas. So if you don’t already own a copy of Wings of War ask your local shop to get you one or Google Shopping or Amazon Wings of War: Revised Deluxe Edition. It comes with 4 planes and all you’ll need to start hour’s worth of fun. I have to go watch Flyboys again, see yah! Get Your Hands Off Me You Damn Dirty Ape !! Why am I just hearing about a RPG game based on one of my favorite movie properties - The Planet of the Apes? I am a gaming addict and FLGS owner. Someone's head is going to roll. I know it's an older game but has anyone played it?, drop me a line and let me know. 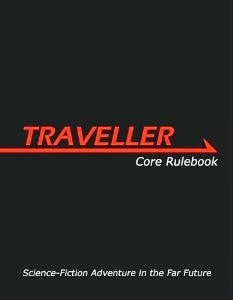 I just picked up the PDF version of the rules and am really excited to play. It's TERRA PRIMATE by Eden Studios (All Flesh Must Be Eaten).